Welcome to The Abso!ute Sound online! We explore music and the reproduction of music in the home. We believe that the sound of music, unamplified, occurring in a real space is a philosophic absolute against which we may judge the performance of devices designed to reproduce music. Our goal is to provide the resources consumers need to judge how a component's sound either honors or departs from the music's truth, and to make sound purchasing decisions that maximize their experience of reproduced sound. Below is our Issue 243, May/June 2014 table of contents and editorial. • Book signing at AXPONA Chicago & Munich for The Absolute Sound's Illustrated History of High-End Audio. • The upcoming Chicago AXPONA show will be big! • High-end audio comes to Saudi Arabia! JV reports. • Steven Stone on a digital process that removes wow and flutter from analog masters. Rotel's roll continues with this eminently affordable new DAC. Spencer Holbert has the good news. Vade Forrester takes you step-by-step through converting your CD library to digital files via the dBpoweramp program. Paul Seydor finds much to praise in this new all-tube amplifier from Zesto Audio. If you're into multichannel music and don't want a digital controller, NuForce's MCP-18 is just the ticket, says Steven Stone. Spencer Holbert discovers the glories of 100W of pure Class A tube power. Connecticut-based Viola has produced a preamplifier and power amplifier that rivals the best Robert Harley has heard. Jonathan Valin on two beautiful-sounding, high-resolution components from Japanese master craftsman Kazutoshi Yamada. Kazutoshi Yamada of Zanden, George Kounnas of Zesto, and Paul Jayson of Viola Audio Labs discuss amplifier design. 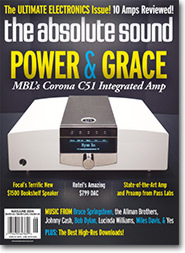 Neil Gader reports on the new cone technology Focal introduces in this marvelous $1500 compact. Robert E. Greene on what may be the lowest-distortion loudspeaker yet. The title of “World's Best” may have been invented for these new 'phones from Abyss, says Chris Martens. Robert Harley explains why this new tube CD player/DAC is a giant-killer. Chris Martens evaluates a new headphone amplifier from one of the industry's leading lights, Alex Cavalli. Scot Hull reports on an extremely ambitious and sonically impressive DAC with an analog-like presentation. Alan Taffel on the iconic rock band's welcome appearance on 96/24 downloads from HDtracks. Andrew Quint reviews high-res classical music downloads. New releases from Bruce Springsteen, the Allman Brothers, Johnny Cash, and Rhonda Vincent; reissues of Bob Dylan, Lucinda Williams, Mark Lanegan, and Yes; three cover CDs of Everly Brothers songs; and four decades of live-in-concert folk music from Caffè Lena. New recordings of Barber, Gershwin, Copland, Enesco, and Cahill, plus five music-only Blu-rays and a program of chamber music recorded live in a bar—on vinyl. The latest from Roy Nathanson, Regina Carter, David Berkman, and Thumbscrew, along with outstanding reissues of Miles Davis on both vinyl and CD. We talk to Jim White, founder of Aesthetix Corporation.